Around the world, about 13 million people inject drugs, the World Health Organization (WHO) reports. Generally, people inject drugs like heroin, cocaine, methamphetamine, or prescription medications by dissolving them in water and then shooting the drugs into veins, arteries, muscles, or directly under the skin (called “skin popping”). Injection drug abuse is a particularly dangerous method of taking drugs. This sends drugs directly into the bloodstream and straight across the barrier between the blood and the brain for a rapid and almost instantaneous “high.” Intravenous (IV) drug use has a high risk for overdose; increased rates of drug dependence, tolerance, and addiction; and numerous other potential complications. The journal PLoS One reports that an estimated 2.6 percent of people in the United States aged 13 and older have injected drugs at some point in their lifetime. 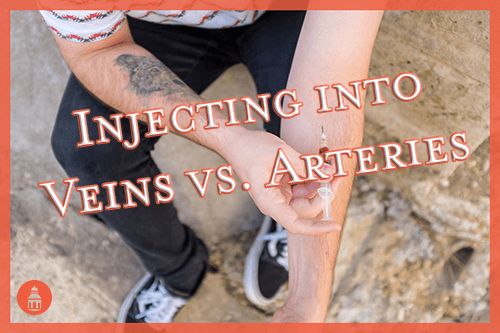 Injecting drugs into an artery is much more dangerous than injecting into a vein, although both methods of drug abuse are considered to be extremely hazardous. The main difference between an artery and a vein is that arteries move blood away from the heart and veins move blood toward the heart. When someone injects drugs into a vein, it is carried through the heart and diluted in the blood before reaching a person’s extremities and tissues. If a person injects something into an artery, this substance is carried directly into the tissues, leading to swelling and excruciating pain. Injecting drugs into arteries doesn’t provide the “rush” a person may be looking for; it causes pain instead. Toxins are pushed directly into the body’s tissue through drug injection into an artery. Where a drug is injected into the body can produce additional issues. For example, injecting into an artery in the neck can cause the throat to swell up and stop a person from being able to breathe or have a toxic and fatal reaction in the brain. Veins are often more superficial and close to the surface than arteries. Injecting drugs deep enough into the body to hit an artery can be highly dangerous. Blood may pool back into the needle when injecting into an artery, causing a kind of “push-back” that may help a person to recognize they are in an artery and not a vein. While any form of injection drug use is risky, injecting into an artery is even riskier. Injection drug abuse, versus other methods of abuse like ingestion, snorting, or smoking drugs, typically has a higher risk for many different negative reactions. The National Institute on Drug Abuse (NIDA) publishes that over 60,000 Americans died from a drug overdose in 2016, a record number of overdose fatalities in the United States. Injection drug abuse raises the risk for suffering from a potentially life-threatening overdose. Drug overdose can cause heart attack, stroke, respiratory failure, internal organ failure and damage, coma, brain damage, and death. Injecting drugs can also cause a person to suffer from collapsed veins; skin and bacterial infections at the injection site, including abscesses; scarring of the skin and “track marks”; infections in the lining of the heart and blood vessels; heart damage; cardiovascular complications; organ failure; and irregular heart rate and blood pressure, to name a few. The journal Wound Repair and Regeneration warns that individuals who inject drugs are nearly 35 times more likely than those who don’t to suffer from chronic venous disorders (CVD) such as venous ulcers. These often occur in the legs as a result of damaged veins and can require surgery to fix. Abusing drugs disrupts the way the mind and body work normally, causing a person to take bigger risks, have less regard for consequences, and make poor choices. Injection drug abuse impairs the way a person thinks and acts, which can have many potential negative side effects. The odds for being involved in an accident, committing a crime or being a victim of one, and getting injured are raised by drug abuse. Unsafe sexual encounters and other potential risky behaviors are often the result of bad decisions made while under the influence of drugs. Memory loss, impulsivity, mood swings that may include hostility, aggression, and potentially violent outbursts can be the result of drug use as well. Men are typically more likely to inject drugs as a method of abuse than woman. The journal The Lancet Global Health publishes that there are as many as 3.2 million women who inject drugs and 12.5 million men who inject drugs on a global scale. Injection drug abuse also carries the risk for transmitting infectious diseases through the sharing or using of needles that may contain contaminated blood. The odds of contracting a disease like hepatitis or HIV/AIDS is raised by injection drug abuse. Injecting drugs can also more rapidly increase a person’s tolerance to the substance. This will mean that in order to get the same high, a person will need to take more drugs each time. Increased dosage elevates the risks of injection drug abuse even more. Escalating dosage due to tolerance from injection drug use can also more swiftly lead to physical drug dependence. The brain uses chemical messengers, or neurotransmitters, to process and regulate emotions, autonomic functions like breathing, heart rate, body temperature, and blood pressure, movement functions, and memory, thinking, and learning abilities. Some of the levels of these neurotransmitters, such as dopamine, are disrupted by drug abuse. Over time, the body can get used to the way these drugs are working in the brain and stop balancing its chemical messengers on its own, resulting in drug dependence. When drugs wear off, difficult withdrawal symptoms can occur, which may include insomnia and sleep disturbances, mood swings, appetite fluctuations, concentration and thinking problems, coordination and balance issues, depression, anxiety, irritability, muscle pain, stomach upset, and more. Addiction often comes along with physical dependence and drug tolerance. 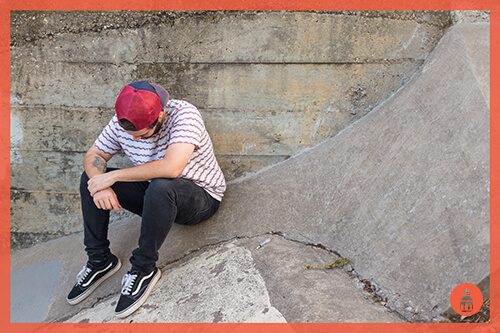 The National Survey on Drug Use and Health (NSDUH) reports that in 2016 approximately 7.4 million adults (aged 12 and older) in the United States battled addiction involving an illicit drug. Addiction is a potential side effect of injection drug abuse. Poppers (Amyl Nitrate): How Neurotoxic Are They? Where to Find a Sober Companion: Do You Need One? What Is a Partial Hospitalization Program (PHP) for Addiction? What Is an Intensive Outpatient Program (IOP) for Addiction? How Long Will Drugs Stay in Your System?